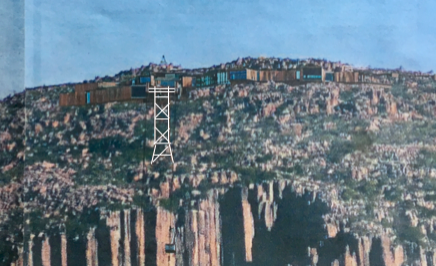 The Mount Wellington Cableway Company wants an aerial shuttle bus—a mass transit system—to carry tourists from the Hobart Tip to its diner on top of the mountain. How do you sell this old idea? Nonsense. Previous proponents have launched half a dozen versions and the MWCC is on its second iteration, hastily re-jigged after its original “Masterplan” had to be abandoned. What the MWCC provocatively describes as “prohibitive red tape to be unravelled” is nothing less than the laws of the land and the regulations that govern them, the statewide planning scheme developed over decades to fairly manage all projects, and the detailed, specific management plan for Wellington Park—in essence, a national park. The cable car is an assault route up the mountain to wolf’s lair upon the Pinnacle. As for it being on the cusp of reality, the scheme is hanging by a thread. From the beginning the MWCC has created conflict in the community. It embraces divisiveness, talking about a “war” for the hearts and minds of the public and politicians through the media. The developer claims that the project was “built from the ground up upon community input and feedback”. If the MWCC was a listener, it would never have proposed this scheme—which has been rejected time after time by the Hobart community. The MWCC’s claims to have consulted the community are demonstrably false, and it is deaf to any negative feedback. The MWCC claimed to have consulted and obtained support from a wide range of community organisations. It listed groups that did not exist (like snowboarding “groups”). It claimed to have consulted with community organisations like the South Hobart Progress Association and the Fern Tree Community Centre—long after they repeatedly stated that no consultation has been undertaken and no support has been offered. It took a parliamentary shaming before the MWCC would withdraw these false claims. It has never acknowledged the deep well of concern in South Hobart, It ignored the key stakeholder: the Tasmanian Aboriginal Centre. The MWCC promised and then cancelled resident group meetings and points instead to support at the other end of the state. Finally, it uses online censorship and advocates trolling strategies against people voicing concern or disapproval. Is it any wonder the company faces increasingly diverse detractors and a broadening coalition of opponents? A cable car would not capture a single gram of carbon. It may be powered by coal. The MWCC for years repeated its own study claim that a cable car would reduce carbon emissions. The Full Proposal now goes much further, suggesting (somewhat contradictorily) that a cable car would be a “carbon-zero journey” and that the scheme would “improve the environment beyond carbon neutral”. Both promises are false. The MWCC has no carbon capture strategy. Nor would the cable car be “a Carbon-Zero Journey” because it cannot guarantee it would be run, as it claims, on “clean green Hydro”. It may well have to run on Victorian brown coal if Tasmania’s network is overloaded or diesel if Basslink breaks again. A cable car would offer the least fulfilling, least healthy, least exciting, least memorable and most expensive access to the Summit. The MWCC advertises the cable car as "the most exciting mode of accessible transport with the lightest environmental footprint". How could a 5-minute ride in a crowded “sky tram” be more exciting than, say, riding on a mountain bike, gripping climbing ropes, sauntering up bush tracks or even driving up that ever-winding Pinnacle Road? 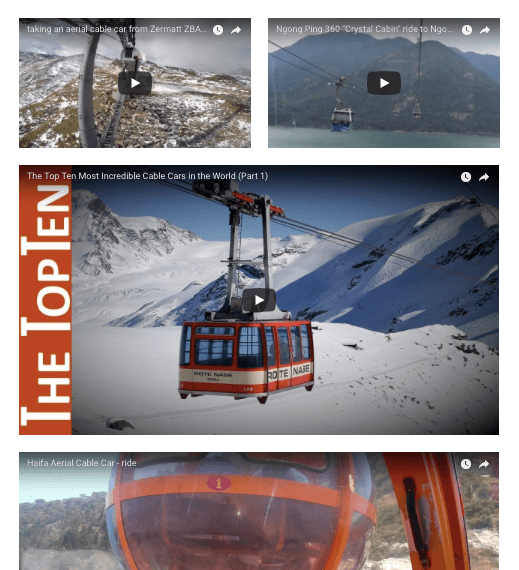 How is a cableway more “accessible”? The road offers far superior access. How is the cableway lighter than a human footprint? The suggestion is ludicrious. The sky trams are spruiked as “uncluttered” and "spacious"—meaning they have no seats and your space will depend upon loading. The carrying capacity is 80 people—and you can bet on the day you go, there will be 80. As the cabin is 6.9 metres long and 3.9 metres wide, at capacity, you will have 33 square centimetres to stand in. If it is a busy day, if you are of average height, if you are about in the middle of the queue, then you will be stood in about the middle of the “tram”. What will you see? Heads. (*Some times may be "seasonally adjusted"). All Skytrams have night-cart mode. After disgorging their last passengers each evening, they go back to the top to be loaded up with all the "waste" from the Pinnacle Centre's 35-seat toilet block. Even suspended far between towers, reliability in gales is high. * (*When the wind conditions are lower than the comfort level threshold). The "comfort threshold" beyond which the cable car will not operate is 80 kilometres an hour. Stick your head out a car window at 80k and you will get the idea. Riding it at even half that speed will be vertiginous for many. 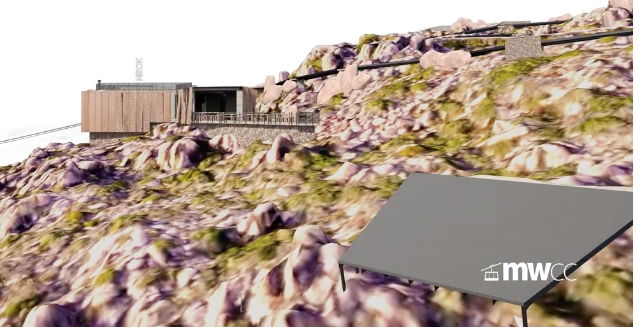 The Full Proposal talks about “installing” a road across "scrubby bush" to reach the cable car Base Station, but botanists see it very differently. The "scrubby bush" to be cleared to reach the cable car base station. That "scrub" is an open forest of silver peppermint gums. Growing on mudstone, such forests are now so rare they are listed under local and national environment protection legislation as "Threatened". The eucalyptus over-story provides habitat for ten species listed as endangered, including one of Australia's rarest orchids and the elusive Masked Owl. Botanists are especially concerned for the critically endangered white orchid known as forest fingers (Caladenia sylvicola). Recently discovered, and known from only two stands, Tip Top is potential habitat. The hill is also habitat for another rare orchid and a critically endangered native grass. A 9-metre wide road is a terrible Threat to such forests. After up to five acres would have to be bulldozed to fit the road, the road corridor would not only bisect the forest and cut a swathe through its canopy, it would alter the drainage pattern on the slope and introduce the very thing the cable car proponent argues is destroying the mountain: streams of cars and tourist buses. Mountain-bikers, joggers and bushwalkers are also angry. The road would cross the purpose-built Tip-Top mountain-biking track, too. The experience for all track users would be transformed from a stroll where they experience currawongs flying uphill at knee height to being a bystander on a road passed by thousands of vehicles a month. The Un-Designed Base Station built in a landslip zone beside a powerline easement. 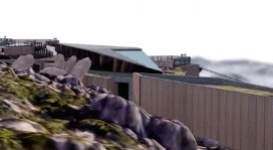 No plans for the building have been released, not even an artist's impression, but notes indicate that this station is a two-story building with passenger services on the top floor and the cableway engine room and power plant below. The proposed site is beset with management problems. Firstly, it is marooned. 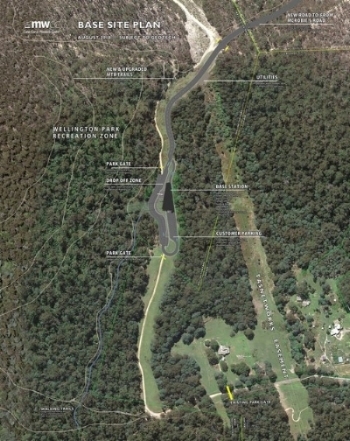 The company cannot build on the sites (or make an access road to it) after both Cascade and the Hobart City Council refused landowner consent to use. The MWCC’s key local advisor Bob Clifford described this site as “hidden in a valley away from easy access” and “just plain wrong from a commercial and traffic point of view”. The siteis zoned 'Environmental Management', is almost entirely a State-listed 'Threatened Forest Community, contains records of commonwealth protected species including a healthy population of Tasmanian Devils and it is within the 'Biodiversity Code' of the Hobart Planning Scheme. The building would be on top of a known landslip area in a “catastrophic” fire risk zone in the Wellington Park’s “Recreational Zone” management zone where tourist operations are not permitted and the management plan’s 'acceptable' building height for the zone is 3.5 metres. The company has no hope of using Council land for a road to approach the station unless the state government compulsorily acquires it, and little likelihood of being granted permission to build a tourist operation on this site. 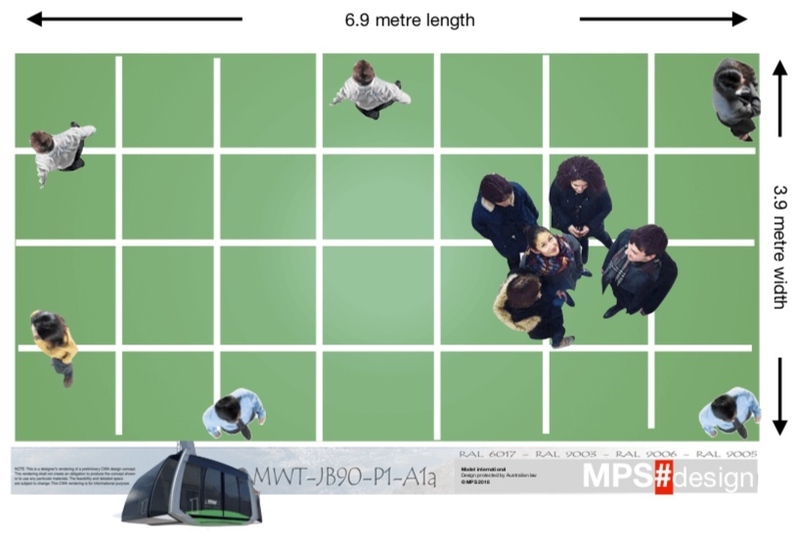 Critics suggest that its 60-car carpark would be inadequate, and would be extended and extended—the very issue the company complains about in another part of Wellington Park—the Pinnacle. The MWCC want to build a castle at the Pinnacle, but the mountain is not a kingdom, it belongs to the public. The MWCC Pinnacle Centre is a worm-like, sprawling building on three levels. With sixteen times the frontal mass of the existing Observation Shelter, the building has the same footprint as a supermarket. Purists would have no building at all on the peak, but many Hobartians would welcome some of its features. The thing is, the best features could all be had without a cable car or this rust-covered monstrosity. What the MWCC suggests is over-kill. The Pinnacle Centre is a high affront to Hobart and it is a supermarket. ROCC spokesperson Ted Cutlan says "Any structure up there would have to be big to be viable, and a big building has a big impact, The top of the mountain is going to be absolutely smothered in people." The MWCC wants on top of the mountain a cafe, an artisan lounge bar, a prisimed rooftop, a restaurant, an amphitheatre and a community event space; and along with all that must come 35 new toilets, a parenting room, CCTV, wifi, security, locker rooms, a grand piano... etc etc etc. For property developers and their building industry allies, a site cannot have too many facilities. The MWCC considers its facilities beneficial. They are “good”, but are they good in and of themselves? They would provide a form of amenity, that is, be pleasant; but only at the expense of the existing amenity—only at the destruction of something which is far more precious because it is so much rarer: the natural amenity of the mountain. The company portrays all its facilities as an Eco Tourism venture. How High Teas, a grand piano, wedding receptions, sommeliers and whisky bars are eco-tourism activities defies explanation. It is not an (ad)venture they offer, it is a resort they have their mind set on atop the mountain. And their avarice and their selfish sense of value will never let them stop seeking more. A health spa, an hotel on the other side of the mountain. They already argue that the Pinnacle is no more than a carpark up there, a city park without the rubbish bins. What harm could a hotel do? The MWCC wants to remove the existing facilities at the Pinnacle: the broad walks and the lookouts and the Observation Building. 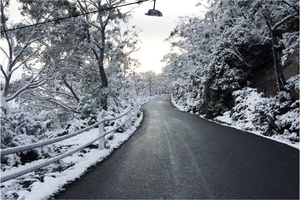 Tasmania has a reputation for making beautiful tracks with natural, on-site materials, but the MWCC would replace the boardwalks with plastic, metal and hydronic heating (to melt the snow) and re-route the tracks into their facility. They want to "improve" the lookouts—by relocating them to the top of their facility. But the MWCC has no power to touch the lookouts or the boardwalks. They don’t own them. They want to somehow half-demolish the Observation Shelter too and put a crane on it to aid construction. Ditto: the Shelter is not theirs to touch. Their public space would have a "prism rooftop for sunrise photographers, Aurora spectators and stargazers", but the shelter’s aspect precludes seeing the sunrise or the sunset, most of the starry sky is blocked by the walls and the declension and superstructure of the prism obscures auroras. How many auroras are photographed from inside buildings anyway? The MWCC says there will be a Park Ranger office in the Pinnacle Centre. When queried about this offer, the Wellington Park's manager of park rangers replied “The MWCC has not formally offered to provide space in its proposed Pinnacle Centre for the Trust Ranger and the Trust has not considered the matter.” The offer is empty. In any case, the Management Plan frowns upon the idea of a Ranger Station at the Pinnacle. The rooftop amphitheatre "would be an ideal spot to pull out the thermos and set up the family picnic as well as for concerts and weddings". Yes, pull out your thermos and watch the weddings. Forget the view, forget the mountain, look at that dress. The MWCC claims the toilets on the mountain-top are inadequate and smelly. They were. But in 2012 flush toilets with a pump-out facility replaced them. “Analysis confirming that pump-out is the most effective and environmentally benign waste disposal means for the Park.” The MWCC wants to build 34 new toilets, and they too will be flush and pump out. 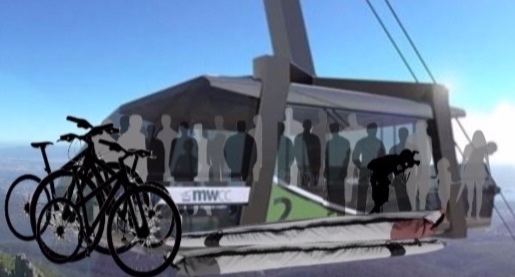 The MWCC will take their effluent off the mountain via the Sky Trams. Ewww. The ultimate “facility” offered is a place to get away from the other facilities: The Sanctum. "A space of solitude. silence. contemplation.” "Something", the MWCC blindly asserts, "entirely new for the pinnacle." Codswallop. The Pinnacle Centre itself destroys the pinnacle's solicitude. The silence it offers is artificial. Its contemplation is funereal. Sanctum means sacred place: a shrine or a church. It is consecrated ground. kunanyi is sacred. The Mountain is a spiritual place, worshiped for millennia and of profound spiritual significance today, and the mountain's spiritual owners, the Pallawah people, have made their abhorrence of a Pinnacle Centre absolutely clear from the start. The Sanctum is sacrilegious. The MWCC promises stories of the mountain and pictures an education centre, but in the fine print interpretation will be restricted to niches. No interpretation centre is shown on the architect’s plans. The MWCC “is committed to funding” (but elsewhere says it will “seek to fund and maintain through our Community Foundation”) three recreational infrastructure projects. These MWCC promises are not only worthless, they have all been rejected. The Pinnacle Centre adds only one new recreational opportunity to the mountain: tea-drinking. Hang-gliding and paragliding enthusiasts are rare birds. The Mountain is for the flying elite—and even for them, freakishly calm weather conditions are required for launch. Contrary to what the MWCC claims, a launch place already exists and is recognised in the Park management plan. (It is no-where near the MWCC Pinnacle Centre, which is wind-prone, and moreover, would introduce a significant hazard to flying: aerial cables.) The MWCC has said for years that "It would be great to foster a flight school and tandem tour operator" but this is never going to happen—and the Tasmanian Hang-gliding Association has explained in detail the reasons why. The MWCC says it will fund “an epic downhill trail connecting the Chalet to Junction Cabin”. This trail route was suggested in 2011, but did not survive examination by trail-building experts World Trail. Their report dispensed with the MWCC route on page 4. And its better alternative (from Big Bend to Junction Cabin) was also rejected on expense grounds because it would have to be so perilously steep and cross such unstable bolder fields. There will be no epic downhill trail connected to the cable car, but the MWCC ignores the expert report. A secondary consequence of this no-start is that one third of the cable car’s expected revenue disappears. We do not believe that the MWCC’s has, as they claim, “met with local snowboarding groups” because there are no local snowboarding groups—probably because the Mountain is not a snow-boarding venue. The MWCC’s offer to provide “terrain park equipment and sports lockers” cannot magically attract snowfalls or alter the slope of the mountain. The MWCC is deaf if it has not heard the condemnation of its proposal by rock climbers. The mountain has over 400 climbs and is a mecca—that could certainly be developed—but climbers are so furious they have commenced an international campaign against the cable car. The cableway would pass directly over the Northern Buttress, a climbing amphitheatre renowned for its sunny position, spectacular views and wild grandeur. A cableway passing overhead would dramatically reduce their enjoyment of the climbing. Citing its emergency rescue option is contradicted by the fact that the cableway would hinder and threaten helicopter rescue. Will the cleverly sited apparatus be virtually invisible? Up close, a cable car is a solid, bus-length object connected to cables that are kilometres long, strung from towers that are more than ten stories high. The closer you get, the more noticeable they become, and their noise increases too, but looked at from afar these visual impacts (eventually) become invisible. Faced with choosing between the close-up and the distant pictorial perspectives, the MWCC typically pictures their creation as seen from far, far away. The cableway will be starkly visible from all over the city. Its top Tower is clearly visible from the mountain’s flanks in Kingston and Glenorchy. The MWCC is so blindly audacious that it claims its monstrosity can "possibly even help improve the natural skyline of the mountain." The fact that the Pinnacle Centre may be built below the skyline does not make it invisible. The Pinnacle Centre is seventeen times the frontal mass of the existing Observation Shelter. It will be shockingly visible. The MWCC’s own visual analysis shows the structure clearly visible—especially from the north and south. Every visitor to kunanyi would see the cable car. It crosses half a dozen walking tracks, it rises above the forest, and it monopolises the summit. There would have been five, triffid-like pylons along the route and the ten gondalas would have been grinding around night and day—up to 14 hours a day over summer or other "peak" times—above the tree tops. Although the proponents have said that towers will be no more that 30 metres tall, how could the cable car pass over a canopy of 30 metre tall tress in Myrtle Gully without its towers being higher than 30 metres? The proponent for Skyway stated that the tower here would be 56 metres high. One airborne Greyhound bus after another passing over the Pinnacle Road, with the Forgotten Tower 70 metres higher than the road like a Wrest Point tower. The cable cars will pass directly over the famous and iconic Organ Pipes Track. The Organ Pipes are said to be "the face of Hobart". Beneath them winds the perfect track—one of Tasmania's ten most spectacular tracks, but above and across them would loom the cableway. Despite the MWCC's "benign" impact mitigation strategy, hundreds of mountaineers from around the world are unconvinced. They have signed an open letter condemning the cable car's route over the Organ Pipes. Crossing the Organ Pipes is the money shot. This is what the ads all show, this is the slash across the face of Hobart. This renowned rock-climbing amphitheatre - with over twenty climbs - is a jewel in Hobart's crown. The contrast between the wildness between your fingertips and the marks of man a thousand meters below is extraordinary. No wonder climbers are outraged. The MWCC proposes to fundamentally alter The Pinnacle. Visitors come to experience the mountain-top and see the view, yet the cable car would dominate The Pinnacle and obscure the view. Cop this, Hobart: The pinnacle will inevitably be subject to demands for additional facilities like this pool at the top of South Africa's Table Mountain cableway. Fancy hot tubs at the summit, poker machines, pogo sticks? Anything could happen. Snow can be made. Its manufacture is noisy and highly greenhouse gas intensive, but, if tourists demand it, the MWCC will make it. The cable cars would be carried between three towers. Though they range in height (we are told) between 36 and 55 metres, it is very hard to find them in any MWCC video or photograph and they are never described in terms of the more recognisable building storey measure: thus the 55-metre Tower Two is equivalent to an 22-storey building. This 15-storey high (45-metres) tower is not even shown in the MWCC’s plan for the Base Station (above left). The middle tower, the tallest, would be 18-storeys (55-metres) high. As it is not near any existing road, how it would be brought into place remains to be explained. The only hint to its existence in pictures was found by a microscopic examination of the image above. Note that the white outline o the photo has been superimposed. Tower 4. 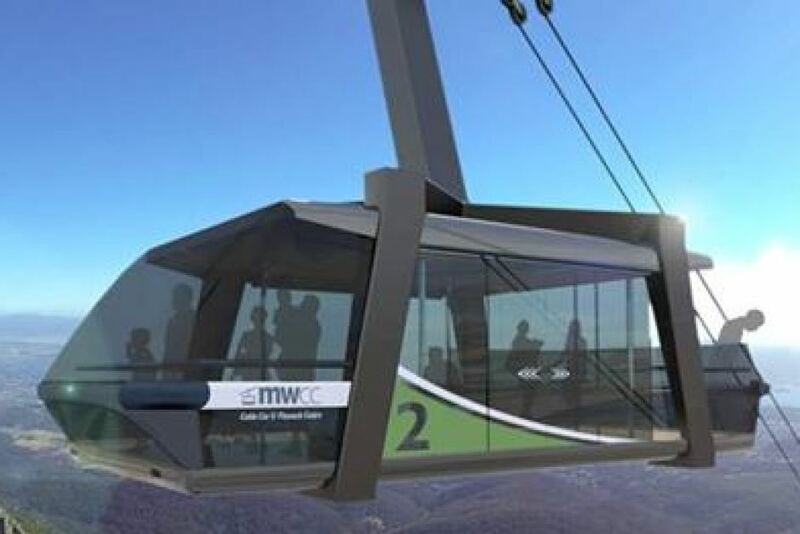 In February 2019 it was revealed that a fourth tower is temporarily required to be constructed in order to string the cableway. Its height has not been revealed. Tower 3 dominates the Pinnacle Zone. It is outside the Pinnacle's commercial zone. It would be 14-storeys (36-metres) high and is holding up three kilometres of cables and all lives. How deep would its foundations have to be dug? Image was supplied to the Mercury newspaper by MWCC. The white superstructure lines are superimposed. The photo below, of the cable car above Vancover in Canada, was used by the MWCC in their Secret Supporter group to indicate what comparable towers would actually look like. What better thing could there be to do on the mountain than turn your back to it and gorge yourself? The Full Proposal asks: "What better way [is there] to spend more time appreciating the mountain...?" Good question. There are countless ways to appreciate the mountain. For example: go outside, touch it, feel it, walk over it, climb, clamber, ride, sit, smell, look... The MWCC disagrees. There is no better way, it says, than to "sit down over an offering of fine Tasmanian produce." Their Tasmanian menu proffers pizza, hot chocolate, tea and coffee. None of these are Tasmanian products. The proponent (of course) brags that the Pinnacle restaurant will "rival the most renowned in Australia". We doubt it because venues with a spectacular view and no competitors don't have to try very hard, do they? The MWCC is so focused on imagining things that it designed a restaurant, picked out its furniture and painted the walls — without approval to build it, let alone operate it. All this finery is inside. Whisky bars, restaurants, cafes: these are popular places and Hobart has plenty of them. The question is: should they be on top of mountains? The Pinnacle Centre removes its visitors from the mountain, the Centre puts its back to the mountain. It offers "views over the Iron Pot, and functional layouts, circulation, compliance, acoustics, lighting and heating." Concrete. Steel. Plastic. It makes opponents sick to their stomach. Whether you admire the architecture of the proposed buildings or not is a matter of taste. Some describe it as twisted, rusted space junk, others love it. How visible it would be from diverse vantage points is of concern, certainly, but should there be any such building with this purpose on that site? Did the architects not have a role to restrain the developer's aggrandising impulse, to be light on the earth. To build something with a higher purpose than shopping? In this duty, the architects failed at the highest level. Can hundreds of thousands of additional people use the cable car and the impact on road traffic be either inconsequential or positive? One of the strange aspects of the whole idea is this: it picks you up in Hobart, probably at the docks, drives you through town and out to the tip. Then it lifts you a thousand metres into the air and offers you the sight of the place you were in fifteen minutes ago. Hobart. The MWCC claims that the cable car will so dramatically reduce the number of cars driving up the mountain the scheme would "give native wildlife a break, extend the lifespan of the road, avoid unsightly widening and decrease pressure on emergency services." The road would be a "safer, quieter experience for families, bird-watchers, bushwalkers and bikers." And up to 1000 tonnes less carbon emissions would spew over the Park. Nonsense. The reduction in car trips (20%) is slight, so all the suggested gains are modest. No "unsightly widening" will ever be done—indeed widening is rejected here on practical grounds. A narrow road is a slow road—and locals accept that. Pressures on emergency services may increase rather than decrease because of the service of alcohol in three venues at the Pinnacle, and increased visitation will likely increase the need for emergency services. The road will still be a road: it will not become a mecca for bushwalking, biking or bird watching due to the cable car. As for carbon emissions, every bit helps, but the cable car's one thousand tons of "savings" have become irrelevant. The MWCC boils it all down to this: "1 extra vehicle trip (either way) every 79 seconds." But this is merely an "expectation", it is "either way"—double—and it is an average. What the sums are in the high summer season, are not stated. The MWCC also suggests that "Cascade Road is operating at only half of its built capacity at peak times." But who wants the road operating at full capacity? "Weekends are significantly quieter and this is when we expect to be our busiest." Say goodbye to quieter weekends, South Hobart. "On weekdays, we propose to only open after the morning rush hour." This is a proposal, it is not a promise. Moreover, the MWCC state that over summer the cable car will operate up to 14 hours a day. "We also propose to incentive customers to use our waterfront shuttle service." Buses. Shuttle buses every ten minutes. The price of the ticket is a significant factor at any tourist attraction, but the price is also crucial to generating support beforehand. If locals considered the price exorbitant support would collapse. So, of course, the MWCC will not say what the ticket price is, but it fosters the perception that tickets will be "affordable", "reasonable" and "family-friendly". But what is the ticket price? The MWCC claims it has not decided on the price, that it cannot know the price and that, quite frankly, it will not reveal the price. Certainly, the company has done its sums and knows the price. How could it persuade itself to proceed, let alone investors, without knowing the pricing? It has provided to the state government’s powerful Coordinator General revenue projections which incorporate the scheme’s ticket prices over weeks, months and years. The MWCC’s website FAQ gives the cable car’s carrying capacity to within one tenth of a percent (the average is 9.6%) and states that “Local pricing for Tasmanians has been built into our operating model”. So…the price is known, but what is the price? Despite continuous questioning, the MWCC still refuses to reveal the ticket price, but it can be estimated. The price will be set for its key audience, tourists, and it will be what they would pay once in a lifetime. A 2018 ReachTEL poll of Tasmanian voters found that about 35% would pay, at most, $10, and another third were prepared to pay $20. Only 14% of Tasmanians would pay $40 or $50 to ride a cable car on kunanyi/Mt Wellington. The real reason the MWCC will not reveal the price it that it will shock locals. Not that the MWCC cares what locals think of the price, because locals are less than twenty per cent of their customers, but not outraging locals, especially their battling supporters before the cable car is built, is crucial to gaining social licence. By comparing the ride time and journey length with other comparable cable car rides, visitor arrivals (totals and segment splits), seasonal occupancy and other revenue balances suggests that the basic ticket price will be $75 return. Family's will pay $150. Locals, if “local pricing” means discount, may pay $60 return on a quiet, cloudy day.